Angela has now adapted her vast diet and lifestyle expertise to address the huge gap in the African health information market. Her Healthy, West African & Wise™ books are the world’s first books providing tailored solutions to the diet- and lifestyle-related health issues facing people of West African origin. They have won her awards and are prescribed by GPs and other health professionals as part of the Books on Prescription service in Southwark, home to the UK’s largest West African community. 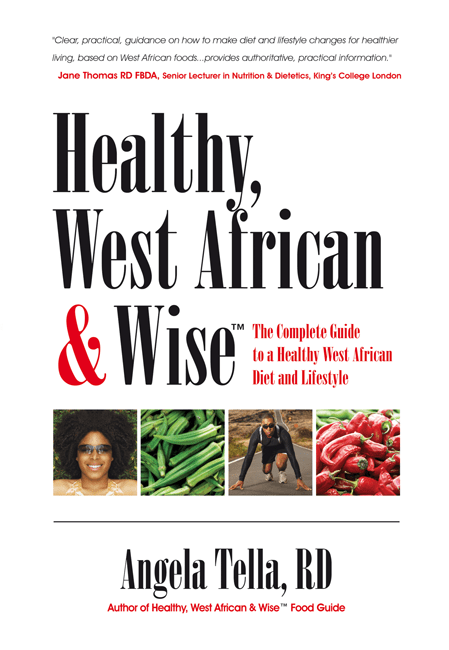 Healthy, West African & Wise™ is the first ever diet and lifestyle book written specifically for people of West African origin, and provides tailored solutions to the diet- and lifestyle-related health issues facing them today. Why chronic health conditions like diabetes, obesity and hypertension are becoming increasingly common in people of West African origin. How to prevent and manage these health conditions. Healthy tips for cooking the foods you love and enjoy, and advice for healthy and savvy shopping. How to avoid cultural stumbling blocks to good health. Making healthier choices when eating out – no matter the cuisine. Practical steps for overcoming barriers to being physically active. Sample recipes with nutritional analysis. Portion size guides for West African foods…and much, much more. 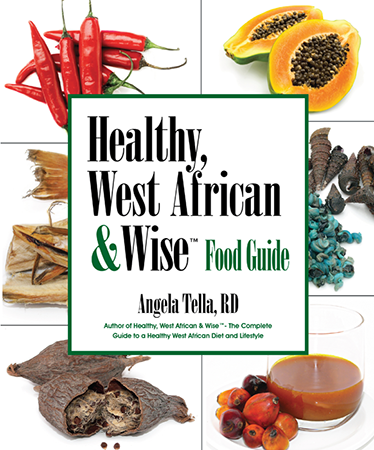 If you enjoy West African food and have ever wondered about its nutritional benefits, then the Healthy, West African & Wise™ Food Guide is the book you’ve been waiting for. With colour pictures and profiling 80 foods that feature in the West African diet, this unique book provides invaluable nutritional information and highlights fascinating facts about each food and its use in West African cuisine. Written as a companion to Healthy, West African & Wise™, this food guide is a must-read, empowering you to eat better today for a healthier tomorrow. I worked with Angela on the Department of Health’s Change4Life programme to tackle childhood obesity. She is an expert in the area of diet and lifestyle, very knowledgeable about West African communities and is able to inspire people to make realistic changes to their diet and lifestyle. She brought valuable insight, bags of enthusiasm and passion to the project. She was a pleasure to work with.